Fragility is a condition that inhabits the foundations of social life. It remains mostly unnoticed until something breaks and dislocates the sense of completion. In such moments of rupture, the social world reveals the stuff of which it is made and how it actually works; it opens itself to question. Based on this claim, this book reconsiders the place of the notions of crisis and critique as fundamental means to grasp the fragile condition of the social and challenges the normalization and dissolution of these ‘concepts’ in contemporary social theory. 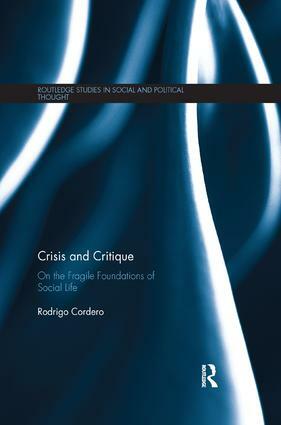 It draws on fundamental insights from Hegel, Marx, and Adorno as to recover the importance of the critique of concepts for the critique of society, and engages in a series of studies on the work of Habermas, Koselleck, Arendt, and Foucault as to consider anew the relationship of crisis and critique as immanent to the political and economic forms of modernity. Moving from crisis to critique and from critique to crisis, the book shows that fragility is a price to be paid for accepting the relational constitution of the social world as a human domain without secure foundations, but also for wishing to break free from all attempts at giving closure to social life as an identity without question. This book will engage students of sociology, political theory and social philosophy alike.